This is something very simple, but very useful. Something Microsoft should've put in Visual Studio in the first place long ago. When I develop data-aware applications I usually end up writing database scripts to make it easy to (re)deploy and version control my database model. I usually write several files just to make things controllable and manageable. But deploying them is a different task altogether. And a tedious one as well. I have to fire up SQL Management Studio and then run all those scripts in correct order. Since this is done rather frequently during application development it seems like a very good candidate for automation or simplification. So let's do just that. This is the starting list, that also needs to be executed in the same order as listed here. If there's a particular lookup table with lots of insert statements I may put those into a separate file so it makes Static/Test Data scripts more manageable. Running these scripts in correct orders is prone to human errors. We may mess up the order of execution or forget to run (or even double run) a certain script. So let's make it possible to execute these scripts directly from within Visual Studio. The first thing to do is to add a batch file (i.e. Deploy DB.bat) to the project that would probably look similar to this: @sqlcmd -S servername -d dbname -U username -P password -i "Drop Objects.sql","Create Model.sql","User Functions.sql","Stored Procedures.sql","Static Data.sql","Test Data.sql" This script will deploy all scripts to our desired database in a single run in correct order and all of the scripts so none will be left out. Test Data.sql script has to be omitted in final deployment scenario. Of course. The @ sign at the beginning only suppresses the command itself to be displayed in the command window. Add a new file here and name it ExecuteBatch.cmd. Go to Visual Studio and right click previously added batch file (Deploy DB.bat) and select Open With... context menu option. This dialog will open where you have to click on the Add... button. Browse for the ExecuteBatch.cmd that you've created previously and give it a nicer friendly name as shown above. Confirm by clicking the OK button. 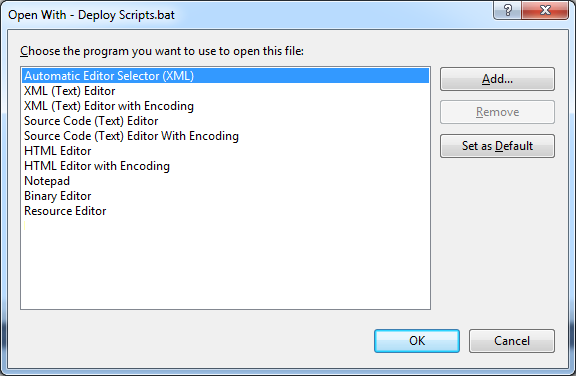 The dialog will now display our new new "editor" which will execute batch files. If you want to, you can also set this one as the default "editor" for batch files (since we started off by right clicking on a batch file). That will mean that by double clicking on a batch file, it will be immediately executed. Confirm everything by clicking on the OK button. Voila! That's it really. Until you reinstall your machine, you'll be able to run batch files from within Visual Studio. Deploying database scripts will become bliss. One thing less to worry about. I like this, but I'd like to take it a step further. How can you use the new ExecuteBatch.cmd to add a dialog in the User Interface for installing your script at the end of your project installation? Hi, Can I use a button click event to call a batch file? Which button would that be? Some button in Visual Studio or anywhere else? I think your best bet would be to write a macro that would do the trick. But you will have to resort to other resources than my blog.